It will be a mistake not to share this recipe at least this mango season. 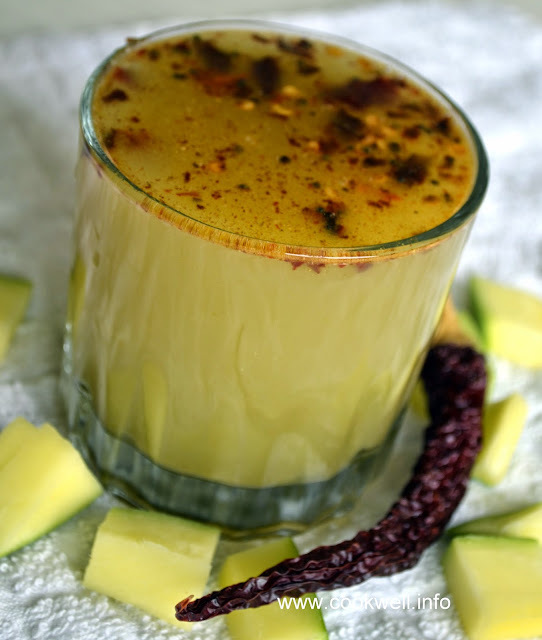 Mavinakaayi gojju is a famous mango drink from Malenaadu region of Karnataka. A lunch never ends without Mavinakaayi gojju during special occasions like marriages, upanayana ( threading ceremony) etc during mango season. 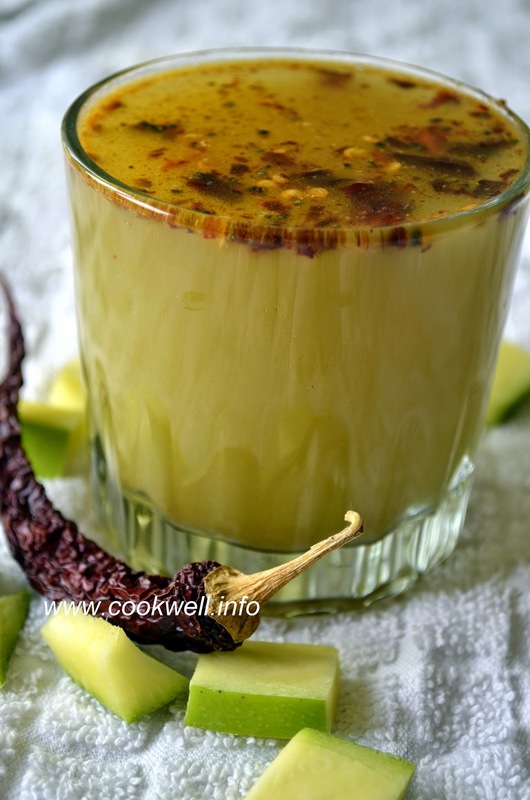 Usually Jeerige mavinakaayi (mango with a very unique flavor) is used to prepare this drink. This type of mangoes are not easily available everywhere. But we can even prepare this drink if you have good flavored sour raw mango. Here I used jeerige mango. If you ask me how did I get this mango in Canada, here is the answer. When I visited India in 2014 it was mango season there. So I brought few tender jeerige mangos and froze them. (I am not sure if we are permitted to bring them into Canada!). Mavinakaayi neergojju can be prepared in many ways. I will post rest of the recipes soon. Mavanakaayi neergojju is not just a drink, it goes very well with steamed rice as well. Having rice with neergojju and little yogurt is just heaven. Give it a try. Let me know how you liked it. Grind cut mango and coconut with 1/2 cup water into fine paste. Add 2-3 cups of water the paste, mix well. Then strain it through a strainer or a muslin cloth. Discard the residue. Add another 3 cups water.Water should be added according to the taste. Then temper with mustard seed, Hing and brokern Red chilli. Once the tempering is done squeez the broken red chilli into tiny pieces to enhance the flavor. Serve with lunch as a drink or serve with steamed rice. Enjoy. Do not blame me latter that you felt drowsy!!! lol. Do we have to peel the mango before grinding?